​NORTH TEXAS REGION – Homes sales in North Texas region were up 4.1 percent to 10,300 in January 2017, according to the latest monthly report for North Texas Real Estate Information Systems (NTREIS). Pending sales decreased 10.2 percent to 7.084, and inventory shrank 5.8 percent to 20,511 units. The median sales prices sailed up 15.4 percent to $225,000, while the average number of days the units stayed on the market dropped 7.7 percent to 48. North Texas Real Estate Information Systems (NTREIS) predicts, "the system is ripe for more home purchasing, if there are more homes available to sell." 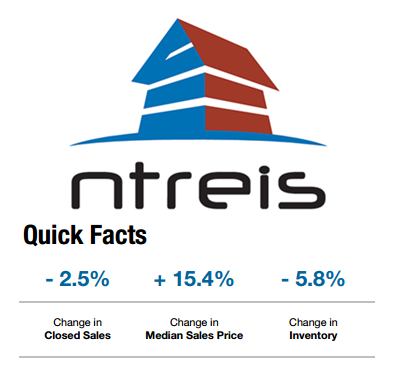 ​See more North Texas Region Statistics here.